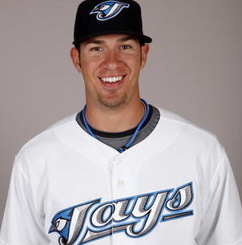 J.P. Arencibia should have a big head. He's hitting .323 as the Jays travel to Fenway Park. Win one for the JEFfer? That might be the war cry for J.P. Arencibia and the Blue Jays as they head into Fenway Park, where their rookie manager, John Edward Farrell, was the Red Sox pitching coach for three seasons. If there’s any extra incentive to latch onto in the next 10 days, the Jays should cling to it like a Barry Bonds’ alibi. They play four games in Beantown against The Best Boston Red Sox Team Ever — who just happen to be 2-9 — before returning home to face the hated Yankees and the Rays next week. That’s nine games against the AL East. If the Jays (6-6) can go 6-3, they should be happy. Scary thing about the Red Sox is that you know they’re going to bust out at some point. The Jays just hope they wait until next week to do it. Boston is off to its worst start in 15 years. Terry Francona’s team lost their first six games and no AL East team has ever made the playoffs doing that. Friday’s series opener features two struggling and winless pitchers both with 7.20 ERAs. For the Jays it’s Brett Cecil (0-1) and for Boston it’s Clay Buchholz (0-2). Hmmmm…. think we’ll see some runs? The Blue Jays keep talking Heart and Hustle. It’s another “H” word they’re desperately in need of, though. During their four-game losing streak, they’ve failed to come up with clutch hits. The starting pitching’s been okay and the bullpen has been dependable, despite the fact Shawn Camp and Jason Frasor blew leads in the past week. Not long after the Maple Leafs’ dim playoff hopes finally flickered out and the Raptors were shamefully smacked around by yet another opponent, the SkyDome* cheered. You didn’t hear it. Only 11,077 went through the turnstiles on Tuesday night. There were so many empty seats even the Butler Bulldogs couldn’t miss hitting blue with their shots (maybe). Well, that’s one way to protect your .750 average. J.P. Arencibia gave way to Jose Molina on Day 2 of the Blue Jays’ season and watched his fellow catcher launch a home run, go 2-for-3 and guide Kyle Drabek to his first Major League victory. Drabek went seven innings, threw 101 pitches and fanned seven as the Jays again won impressively, 6-1, on Saturday. The key piece in the Roy Halladay deal walked three and surrendered just one hit in his fourth career start. Molina and Drabek worked closely during spring training, so it’s not a surprise manager John Farrell would have them form the battery. 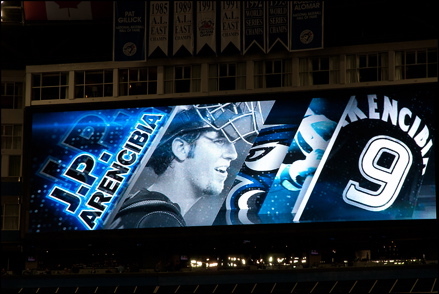 Arencibia Nation can count on their hero being back in the lineup Sunday, where he could actually pad his lofty numbers from opening night against the mediocre Nick Blackburn, who posted a 5.42 ERA last season.